Happy New Year! Be sure to save the date for Adaptive Planning’s Annual User Group. 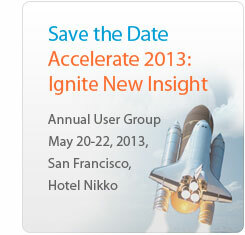 The conference will be held May 20-22 in San Francisco at the Hotel Nikko. You won’t want to miss this landmark event, which will mark the first time Adaptive Planning conducts a single conference for customers worldwide! It’s an opportunity to network with and learn from hundreds of peers and experts in a beautiful setting.